Find hotel near Riserva Naturale Fiume Ci ..
Tucked in the lush green terrains of Syracuse, the Riserva Naturale fiume Ciane e Saline di Syracuse offers a place filled with natural treasures and enchanted by Greek-Roman mythological stories. Story goes that Anapo transformed into a river to meet Persephone- the daughter of Zeus and Demetra at the Grand Harbor of Syracuse. 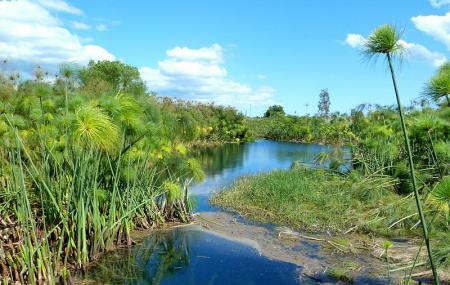 The park itself is famous for preserving the Papyrus plants that are grown here extensively. The heart of the park- Ciane river that is born from the Pisima and Pisimotta springs, truly breathes life into this place. The highlight of the place is that it is home for a species of Papyrus- the only plant imported from Egypt to Sicily by the Arabs (a rare step since the Egyptians wanted to keep their method of paper making a secret). The reserve also has a flat land that was used for mining salt from the 17th century till the 1980’s. Today, the reserve focusses on preserving and recovering the salt basins too. The best way to explore the river is by taking a boat ride and see the papyrus plants grow in ample amounts while hikers can explore the land by having a trek through the lush pathways. Carry bottled drinking water and food with you if you plan to stay here longer. How popular is Riserva Naturale Fiume Ciane E Saline Di Siracusa? People normally also visit Ragusa while planning their trip to Riserva Naturale Fiume Ciane E Saline Di Siracusa.